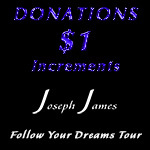 Donate Joseph James - Follow Your Dreams Tour [DonateJJ-FYDT] - $1.00 : Beneficial Zone, Everything is permissible, not everything is beneficial! Donate to Joseph James to help in his FOLLOW YOUR DREAMS project, music, and outreach tour. TOURING | Joseph James is touring with his concerts and production to promote a simple message, “We are here because we care and we hope that is enough to help you stay on this earth a little while longer to fulfill your dream!” Suicide kills dreams, breaks the hearts of loved ones and shatters the lives of many survivors. BOOKING | NOW BOOKING across the USA with Joseph’s concerts. He will be joining up with other artists and comedians along the way to provide a fun show with encouragement and hope to those who need it. We are bringing encouragement and hope to the communities of our nation and beyond, as we plan to travel the US, Canada, Europe, Australia, South Africa and many more. So many have lost hope and are contemplating ending it all. Enter the quantity for dollar amount. Please Note: We are not a non-profit organization at this time, so your donation may or may not be tax deductible. Thank you for helping us help others. Save A Life!